Six was the number that Dundee fans had in their mind going into the game – the gap Hamilton Accies had opened up on Saturday. 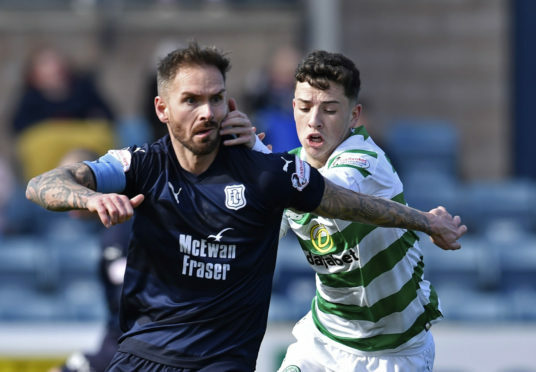 And six was the number they were talking about as they left Dens Park – the minutes of stoppage time Bobby Madden controversially added to the 90. It was in the very last of them that Odsonne Edouard scored his winning goal to deny Jim McIntyre’s men a precious point that they thought they had earned through a gutsy defensive performance. The Dark Blues were as good as their manager could have hoped for at the back and had a couple of breakaway opportunities to score. But it is late, late goals like this that have created a 10-point advantage at the top for Celtic and will make them champions. For Dundee, they will have to take heart from their display for 95 minutes and try to forget about what happened in the 96th. McIntyre is usually a four-at-the-back man but he went with five on this occasion, with Ryan McGowan, Gensy Kusunga and Darren O’Dea all playing. John O’Sullivan made his first start. For the Hoops, Callum McGregor was back in their starting line-up after a few weeks out injured. No player has scored more goals against Celtic this century than Kenny Miller and he caused them an early problem with good hold-up play in the box on two minutes. Miller laid the ball off to Ethan Robson, whose floated effort drifted over the crossbar. A minute later Seny Dieng could do nothing but sit on the grass and hope as a Kieran Tierney shot took a big deflection and spun just the wide side of the post. Dieng could do nothing on that occasion but his reflexes saved Dundee on 16 minutes when he reacted instinctively to keep out a McGregor shot that had been re-directed on its way to goal by Scott Sinclair. The Celtic winger was a lucky man not to get booked shortly after when he went down in the box claiming a penalty without James Horsfield impeding him. The pressure was building now and Dieng was called into action to save from Edouard. Dundee weren’t without moments of encouragement, though. Miller crossed the ball in from the right and Scott Bain had to come out to intervene. He chose not to try and catch the ball and needed the help of Scott Brown to thwart Scott Wright. Celtic were forcing plenty of corners and from one of them on the 36th minute, James Forrest’s 20-yard volley was fiercely struck and on target but blocked by Dieng. The on-loan QPR keeper would have been happy with a full-stretch dive to deny Sinclair on the angle moments later but wouldn’t have been happy at his defence falling asleep to allow the shot in the first place. For all Celtic’s territorial dominance, it was the hosts who created the best first half chance just before the break. Miller, not for the first time, was a useful outlet for a ball out of defence. He kept it under his control in midfield until Wright ran beyond him and then stroked a perfectly-weighted pass forward so that his team-mate didn’t have to break stride. It was now a one v one battle between Wright and Bain of the type Dundee fans have seen their former keeper win on many occasions. Win it he did again, blocking the attacker’s shot. Celtic didn’t get in behind the Dundee defence too often in the first half but they managed to do it within seconds of the re-start. Mikey Johnston found a big space to run into down the left and his cross took Dieng out of the equation but was just too firm to allow Edouard a back post finish. It was to the home team’s credit that virtually nothing worthy of note happened in the next 15 minutes, certainly nothing that Dieng had to worry about. Long-range shots were getting blocked before they got near to him and passes from midfield to front from Celtic’s creative players were missing their targets. A Tierney 25-yarder on 71 minutes was the best they had to offer but even that didn’t work the keeper. Dundee made a double substitution around that point, with Craig and Jesse Curran coming on for Miller and O’Sullivan. We were into the last 10 minutes and Celtic were starting to show a bit more urgency but the solid Dundee bank of five was holding firm – the crowding out of Forrest when he shot in the box a perfect example. There was even an air of panic at the other end when a weak back pass gave Wright encouragement to put pressure on Bain who was outside his box and had to dribble past the on-loan Aberdeen man to get the ball clear. Celtic this season just can’t be counted out however. In the sixth minute of stoppage time they got their winner through Edouard, after Dundee had squandered a promising counter-attack situation. Neil Lennon was charging down the touchline to celebrate at the corner flag and the Dundee players were left with only a hard-luck story to show for their efforts.